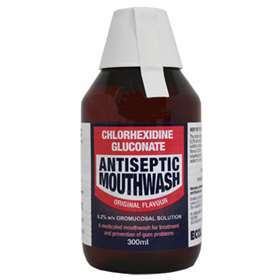 Chlorhexidine Gluconate 0.2% w/v Antiseptic Mouthwash treats and prevents gum disease. A peppermint mouth wash for the treatment and prevention of gingivitis (gum disease), gum ulceration, oral thrush, denture sores and for maintaining general oral hygiene. Chlorhexidine Gluconate is a disinfectant and antiseptic. It reduces the formation of dental plaque and fights infection in the mouth and upper throat. Adults, the elderly and children; measure 10ml in the cup provided, rinse the mouth thoroughly for approximately 1 minute, spit out the liquid. Treating gingivitis (gum disease): Use as above, for one month. Mouth Ulcers and thrush: Use as above, continuing for 2 days after symptoms go. Denture Sores: Use as above, also soak dentures for 15 minutes twice a day. Once opened use within 28 days. Consult your GP or pharmacist if you are pregnant, may be pregnant or breastfeeding. Do not use this mouthwash unless you have been advised to do so by your GP. Also contains; Ethanol, Castor Oil Polyoxyl, Aspartame (E951) and purified water. Alcohol 7 vol%.